This Silicon Valley hotel is in Milpitas, 2 miles from the Great Mall, and within 6 miles of California's Great America and San Jose. Access Silicon Valley while enjoying tranquil views of the East Bay hills. Near Fremont, Newark, the Great Mall of the Bay Area, and San Jose. Silicon Valley stress reduction. Opens in a new window. South Bay sports. Opens in a new window. 5 reasons to love San Jose. Opens in a new window. From Silicon Valley to space. Opens in a new window. Fast check in , very comfortable bed , well lit parking lot . It is under renovation so it will look better soon . Where to find Milpitas hotels near an airport? How can I find hotels in different Milpitas neighborhoods? Where can I find hotels in Milpitas that are near tourist attractions? Hotel and apartment choices are aplenty in Milpitas. The Expedia database has 88 hotels within a 0.1-kilometre (0.06-mile) distance of the heart of Milpitas. Travelers keen to find a hotel close to the heart of Milpitas, can check out the rates and amenities at the Best Western Plus Brookside Inn and Heritage Inn. One of Milpitas' best known tourist attractions is the Great Mall of the Bay Area. The Homewood Suites by Hilton San Jose and Staybridge Suites Silicon Valley, are all within strolling distance of Great Mall of the Bay Area. Milpitas offers a selection of budget hotel options sure to please thrifty visitors. 2 kilometres (1 mile) away from Milpitas' downtown you'll find the Larkspur Landing Milpitas - An All-Suite Hotel. 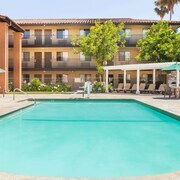 The Extended Stay America San Jose - Milpitas is just 2 kilometres (1 mile) away. The Heritage Inn and the Milpitas Inn are two alternative economical options worth investigating. The Garden Court Hotel is 20 kilometres (14 miles) from the main part of Milpitas. Another alternative is the Four Seasons Hotel Silicon Valley at East Palo Alto, which can be found 20 kilometres (13 miles) away. 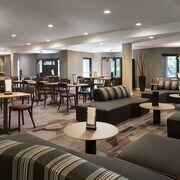 Alternatively, check out the amenities and rates at the The Westin Palo Alto or the Stanford Park Hotel. 17 kilometres (11 miles) away from Milpitas you will find Fremont, where you can enjoy Mission San Jose and Ardenwood Historic Farm. The TownePlace Suites by Marriott Newark Silicon Valley and Homewood Suites by Hilton Newark/Fremont are some of the long and short-stay alternatives in Fremont. 10 kilometres (6 miles) to the south of Milpitas, is San Jose, home to the Hotel De Anza and The Fairmont San Jose. The Winchester Mystery House and San Jose State University are popular attractions to check out when you're in San Jose. If you enjoy sports and enjoy watching local games you could visit SAP Center at San Jose, which is 10 kilometres (6 miles) to the south of Milpitas. For tourists who are interested in sleeping close by, make a reservation in the Staybridge Suites San Jose or San Jose Marriott. Situated 7 kilometres (4 miles) away from Milpitas is Norman Y. Mineta San Jose International Airport. Stay nearby at Holiday Inn Express Hotel & Suites Santa Clara or The Westin San Jose. What are the most popular Milpitas hotels? Are there hotels in other cities near Milpitas? What other types of accommodations are available in Milpitas? Explore Milpitas with Expedia.ca’s Travel Guides to find the best flights, cars, holiday packages and more!